A pretty hollyhock bloom opens to its fullest and adorns the garden at Lucy Maud Montgomery's house in Cavendish, Prince Edward Island in Canada. Lucy Maud Montgomery is the author of the well known book Anne of Green Gables and the house and grounds are now a National Historic Site that tourists can visit. Hollyhock, Alcea, bloom at the site of Lucy Maud Montgomery's Cavendish home, (author of Anne of Green Gables), a National Historic Site, Blue Heron Coastal Drive, Queens, Anne's Land, Prince Edward Island, Canada. 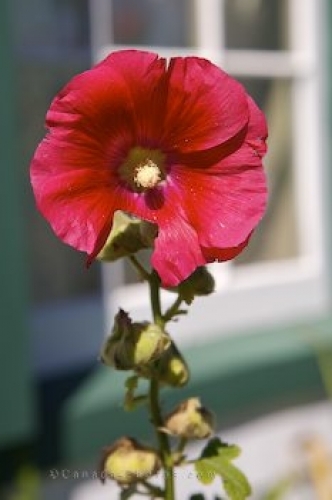 Picture of a red hollyhock in a garden at Anne of Green Gables in Prince Edward Island.